The CNNMoney Tech 30 index measures the performance of 30 major technology stocks around the world. Meet the CNNMoney Tech 30: an index of the most important tech stocks. The Tech 30 is a mix of the industry's giants, such as Amazon (AMZN), Apple (AAPL), Cisco (CSCO), Facebook (FB), Google (GOOG) and Microsoft (MSFT). The pure-tech focus differs from other tech stock barometers. The Nasdaq, for example, is often cited as a "tech index" but only 42% of the composite is made up of tech companies. The S&P 500 Information Technology index includes several stocks that aren't typically considered at the cutting edge of tech, such as MasterCard (MA), money transfer service Western Union (WU) and consulting firm Accenture (ACN). To track the performance of the Tech 30 index, we "invested" $1,000 in play money in each of the 30 stocks on January 2, 2014. So the baseline for the index is $30,000. The CNNMoney Tech 30 portfolio page displays values for both the index as a whole and the specific stocks. The graphic at the top of the page measures the stocks' performance relative to one another from the beginning of the year. The bubbles for the better-performing stocks will appear larger. We don't plan to make regular changes to the Tech 30. But if a current Tech 30 company is acquired or goes private, we'll replace it by "investing" in a different stock. We'll include the Tech 30's performance in our daily market writes as well as in stories from our investing and technology writers about these 30 companies. 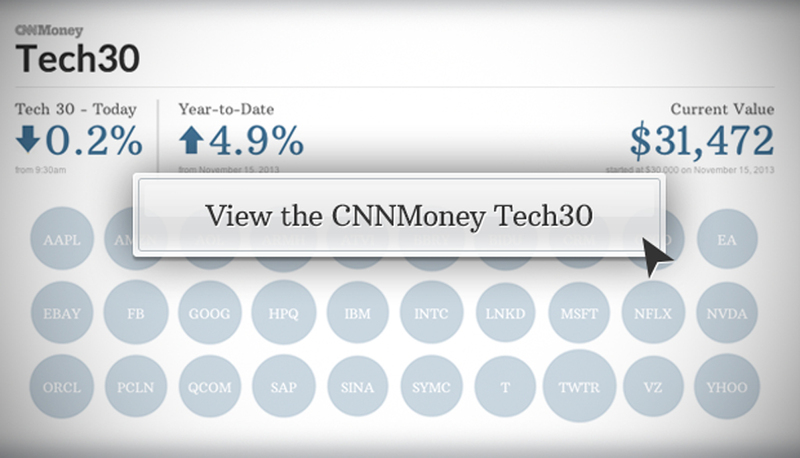 Check out the CNNMoney Tech 30 here.